President of Jagriti Child and Youth Concern Nepal and General Secretary of Association of Youth Organizations Nepal (AYON) Mr. Tilottam Paudel has been honored by National Human Development Forum for his tremendous efforts, contributions and a decade long work in the field of Children, Youth and Peace Building in rural areas and in the time of armed conflict. He has been working in this field for nearly one decade. He is one of the prominent pioneering people to establish first Child Clubs in Nepal and fought legal battle to initiating for the establishment of child clubs in Nepal. 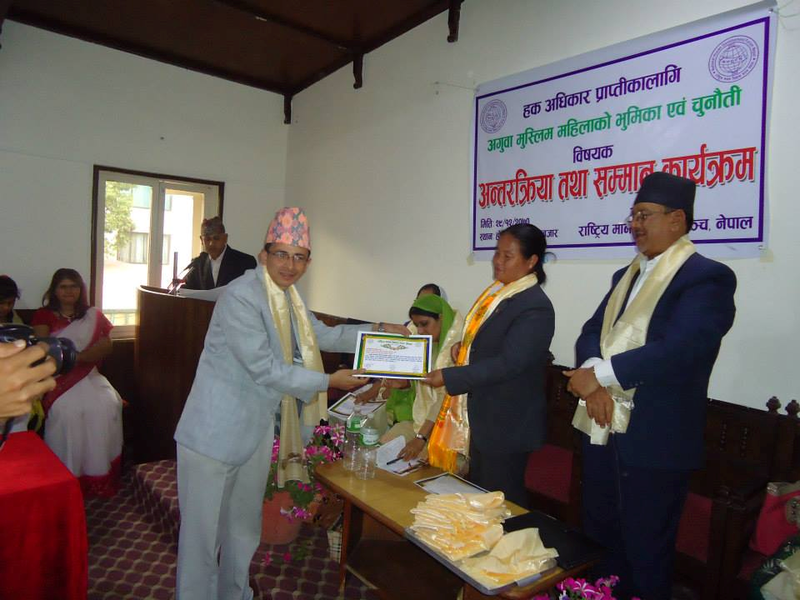 Additionally, Dr. Kashim Shah advisor of JCYC- Nepal has also been honored by NHDF for his exceptional work and contribution in health sector as he has worked in most of the rural areas of Nepal. In the mean time, another 19 other constituent assembly members have also been honored and a discussion has been organized on various other issues as well. Chief Guest for the program was Ms Onsari Gharti, Vice-Chair person and deputy speaker of the Constituent Assembly, and other guests included member of national women commission along with reporters and other concerned stakeholders. After receiving the honor, Mr. Paudel expressed that, this has certainly motivated JCYC-Nepal to work hard in the future and certainly has recognized JCYC Nepal as a prime organizations working in the field of child, youth and peace in Nepal.